Lay a solid foundation for the next generation of your business. Get help from the experts on building your next generation of business leaders. Evolve Partner Group are leaders in succession planning. Our team of business experts will help you lay a solid foundation for assessing, developing and engaging your top talent. Succession readiness prepares individuals and organizations for the successful, orderly transition of leadership and management responsibilities. Evolve Partner Group's strategic planning support enables you and your team to develop a clear business plan with measurable objectives. In today’s rapidly changing business landscape, do your current and prospective leaders have the skills they need to bring your company to the next level? To build a world-class organization, you need leaders who know how to leverage their strengths and influence others. If you are a part of, or are considering joining a family business, you know that there are many unique dynamics that come into play. 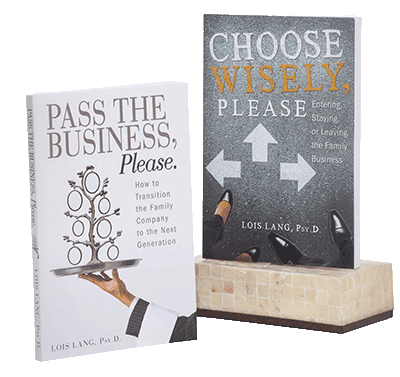 These books provide unique insights for business owners preparing to hand their business down to their children, or for the next generation preparing to enter the family business. We can partner with you to build your business and strengthen your talent. Let's get started. Evolve Partner Group is a business consulting firm with locations in Seattle and Northern California. We specialize in succession planning, helping business owners put their companies on the right path for the next generation.